Fabio Capello held positive talks with the Football Association on Monday over his future as England manager, BBC Sport understands. Capello had a phone conversation with Club England chairman Sir Dave Richards and a senior FA source said the Italian received the assurances he wanted. A meeting is now expected to take place before the England squad fly to South Africa on Wednesday for the World Cup. The Italian, whose deal runs until 2012, has been linked to Inter Milan. Plus his contract contains a clause that allows Capello to quit after the World Cup. However, having made a verbal agreement with former Football Association chairman Lord Triesman to stay on beyond Euro 2012, Capello is keen to put an end to any speculation. "I always say the same things," said Capello in response to questions about his future following England's 2-1 friendly win over Japan in Graz. "My name is always in the newspapers. My name has been on the radio but I can't say anything about it. I have not spoken with anyone from Inter Milan." Triesman was forced to resign earlier this month after what he referred to as his "entrapment" by the Mail on Sunday newspaper. But just prior to Lord Triesman's departure, Capello was widely believed to be ready to rip up a clause in his current deal that allows either the former Juventus coach or the Football Association to end the contract early this summer. Triesman's departure therefore threw Capello's position into confusion and opened the door to reports that the 63-year-old could head to Inter after the World Cup as a replacement for new Real Madrid boss Jose Mourinho. However, with the appointment of Richards, plus that of communications chief Adrian Bevington, who has been confirmed as Club England's new managing director with immediate effect, some clarity has been brought to the situation. Capello had made it clear that he wanted his future resolved before the team leave for their World Cup adventure on Wednesday evening. 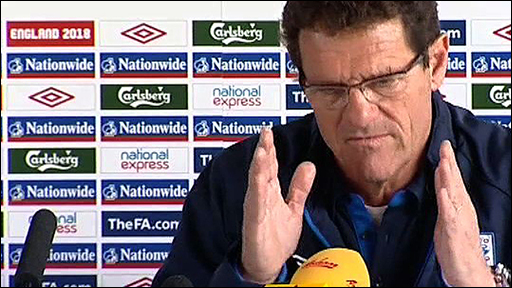 In any conversation about his contract, Capello always qualifies it with the claim that if England fail to match expectations in the World Cup finals in South Africa, which start on 11 June, he could easily find himself surplus to requirements. Such is the improvement that has been made since he succeeded Steve McClaren in December 2007, though, such a scenario is unlikely to unfold.